Never warm a port before a fire, and always serve from a decanter. Even in the finest and best bottle Ports there is always the risk of an occasional ‟slipped crust,” due to shaking up in transit. If this crust has properly hardened it will not cloud the wine, and in any case, if the above directions as to decanting are carefully followed, the wine should be perfectly clear and free from sediment. The best Vintages are 1896 (very fine), 1900, 1904, 1908 (excellent, fine quality), 1912, 1920, 1922, 1924, 1927. The cellar temperature should be about 58Â° Fahrenheit. All Wines, and occasionally even Spirits, are liable to become tainted with that most objectionable odour and taste. However great the care exercised in bottling, no certain means of its elimination has yet been discovered. Should a bottle be found in this condition, the Member is requested to return it to the Society when allowance for it will be made. 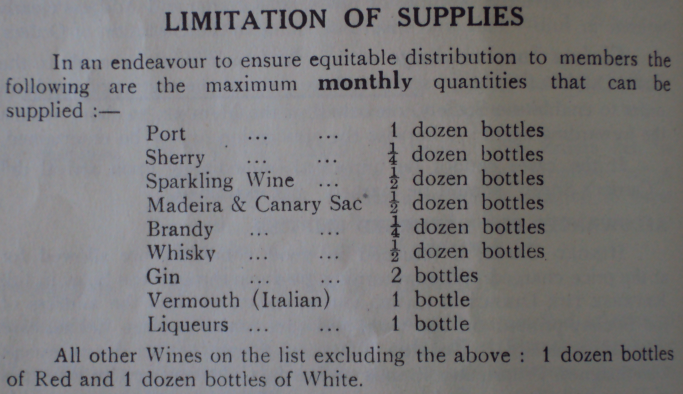 This does not apply in the case of Vintage and Old Bottled Ports, or ChÃ¢teau Bottled Wines.